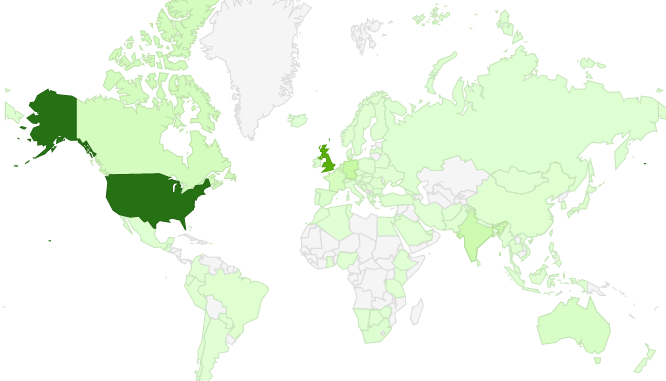 The Analyst Equity blog had visitors from exactly 100 countries over the last six months. 42% of visitors are in the United States and a further 42% come from seven other counties, all of which have notable communities of analyst relations professionals: (Australia, Canada, France, Germany, India, the Netherlands and the UK). What’s fascinating are the 92 other countries. There’s a huge growth of readers in Asia: The top 30 sources of readers worldwide include China, Hong Kong, Israel, Japan, Malaysia, the Philippines, Singapore, Taiwan, Thailand and the UAE). Now roughly one in every eight visitors to the blog comes from Asia. Indeed, when I look at the 20 cities sending the most visitors, it’s thought provoking to think that there are eight in the US (Austin, Boston, Cambridge, Chicago, DC, NYC, Portland and San Francisco) and in Asia-Pacific there are also eight (Bangalore, Chennai, Karachi, Mumbai, New Delhi, Singapore, Sydney and Tsukuba). Africa is also being more visible: while most of those visits come from South Africa, the other visits are spread across more than a dozen countries, including Kenya, Nigeria and the Mauritius. These 100 countries show more than who shares your interest in this site: it shows the footprint of analyst influence, since interest in AR is determined by the analysts’ impact and their location. The latter is a major factor, since the 100 networks sending the most visitors to this website include the 451 Group, Aberdeen/Harte-Hanks, Canalys, the Corporate Executive Board, Current Analysis, Forrester, Gartner, IDC, the Informa group, Info-Tech, Pierre Audoin Consultants and the Technology Evaluation Centers. Surprising, a few not-for-profit organisations send notable numbers of readers, including the American University, CUNY, NYU, UCSB, and the US Navy. It’s quite humbling to think that visitors with computers using 97 different languages have visited the site (the top 3, interestingly, are English, German and Japanese), but is also shows the global spread of the AR community. That means something important for analysts and for analyst relations managers. We are no longer in the world where the majority of people concerned with analysts are in the US. Both the analyst firms and AR professionals need to consider how their tasks need to shift to meet that new reality. This entry was posted in Asia-Pacific, Emerging markets. Bookmark the permalink.